"Even if you get lucky, you're getting the worst seat in the house." 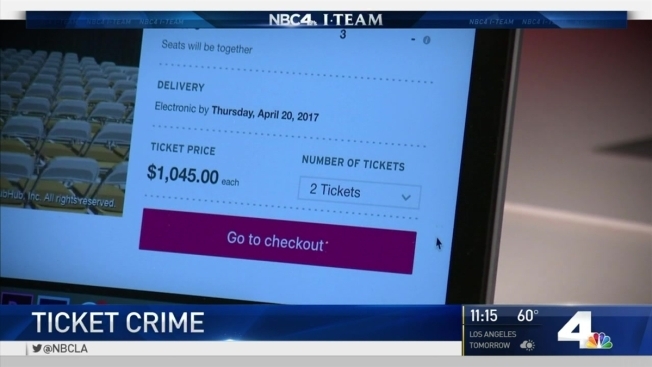 Cyber criminals are blocking your attempts to purchase good seats to concerts and games at a reasonable price, and California's legal attempt to stop them appears to be failing, the I-Team has learned. A growing number of online scalpers are using "ticket bots," automated computer applications that can hold, then purchase, hundreds of tickets the second they go on sale at primary sale sites. "You have no chance at all," said industry insider Tony Knopp, CEO of InviteManager, a Calabasas-based company that helps corporations like American Express, Verizon and Staples manage ticket purchases. Before co-founding his business, Knopp held an executive position at StubHub, on online platform that connects fans who want to buy and sell tickets. Knopp says ticket bots have made scoring a seat at just about any event at face value practically impossible. "Even if you get lucky, you're getting the worst seat in the house," Knopp said. In recent years, ticket bots have accounted for as much as 90 percent of the traffic on Ticketmaster's website, snagging up 60 percent of the best seats to popular concerts, shows and games. In response, Ticketmaster tells the I-Team it has implemented improved detection software that has blocked five billion ticket bots. Yes, that's "billion" with a "b." But it's an uphill battle. "As with hackers, for problems solved today, bot codes are being rewritten tomorrow," a Ticketmaster spokesperson told the I-Team. "We are in an arms race and will continue to invest millions of dollars and resources to fight bad actor bots." The ease of acquiring a ticket-buying bot adds to the challenge. The programs are offered for sale on many websites, for as little as a few hundred dollars. In 2013, a new law introduced by State Senator Richard Pan (D-Sacramento) made the use of bots to evade security on ticket sales websites a misdemeanor crime, subject to up to six months in jail and fines up to $2,500. Despite weeks of research, NBC4 could find no evidence that the law has ever been used to prosecute bot users. The I-Team filed a public records request with the California Department of Justice to find out how many cases have been prosecuted under the law, and were told the office was "unable to locate any responsive records." The District Attorneys in Los Angeles, San Francisco, San Diego and Sacramento also had no records of the law ever being used in the prosecution of a ticket bot crime. The I-Team reached out repeatedly to State Senator Pan to ask his reaction to our findings. He declined to comment, but spokeswoman Shannan Martinez said "the bill was meant to provide law enforcement with a tool, and the issues [the I-Team] has brought up have to do with enforcement." "Those who oversee enforcement decisions can speak to the resources they put toward this issue," added Martinez. The I-Team contacted the Los Angeles District Attorney's Consumer Fraud Unit for comment. That request was also denied. Sign up for a credit card that offers pre-sale tickets to concerts, games and shows. If the show sells out quickly, don't immediately buy tickets from a secondary vendor - they know fans are highly motivated in these hours, and will be charging the highest prices. If you buy from a secondary vendor, choose a market you can trust (some established sales platforms will guarantee tickets aren't fake, or promise to investigate consumer fraud claims). If your nerves can take it, wait until a few days - or hours - before the concert or game you want to attend. Sometimes, promoters and venues will release tickets just before the event, in what's known in the industry as a "ticket drop."